Oshkosh Waterfest Rocking the Fox! Exit Highway 44 to South Park Ave.
Take South Park Ave northeast to Main St. Turn left on Main St and go north over the Main St bridge. Turn right (east) on to Ceape Avenue and travel for two blocks. 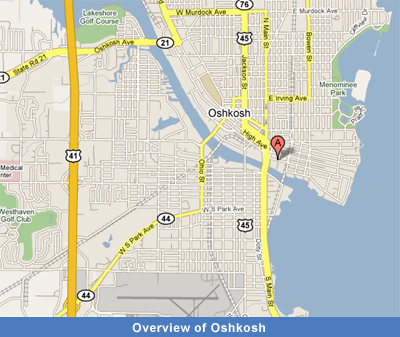 Riverside Park and the Leach Amphitheatre is located just past the Oshkosh Convention Center. Exit State Highway 76 (Jackson Street) and travel south on Jackson Street. 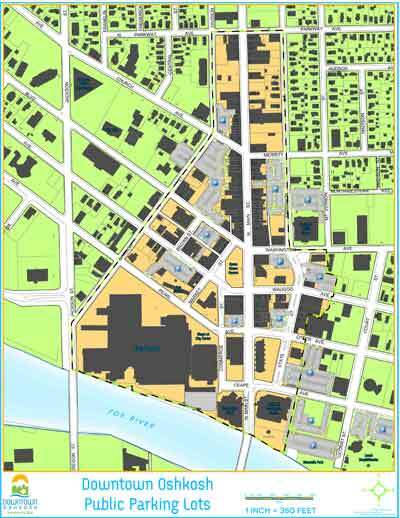 Turn left on Pearl Avenue just before the Fox River and travel south east to Main Street past US Bank. Turn Right on to Main Street and travel south one block to Ceape Avenue. Turn left on Ceape and travel two blocks east for some good tunes! 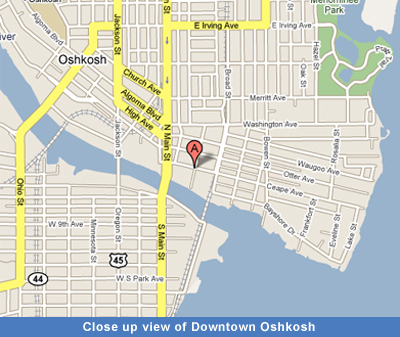 Click on the image below for a full-size parking map of the Downtown Oshkosh area.